Pardon the corner pun, but this intersection is riddled with two major issues: Litter and Reckless Driving. The southeast corner for the address specified is the one hit the worst by both issues. Pedestrians litter with reckless abandon on the lawn and in the bushes of this home to an astonishing degree and they should be ashamed of themselves. Drivers whip around this turn (right turn from River heading north to Milford heading east) and rarely stop or even slow down. The solution for the littering is NOT a town garbage can on that corner. Instead, post a sign indicating a newly-imposed file for littering offenses, and then actually catch/fine someone in the act from time to time - high schoolers definitely included! In my opinion, that's the only way to deter people. An additional measure could be to engaging the high-school's student environmental group (if they have one) and make it an item of which they're aware. As for the reckless driving, solutions would probably result in signs for possibly a No Turn On Red or maybe a Slow - School Zone? Additional measures would be deliberately increasing police presence and citations given on this specific corner. Anyone questioning the hazardousness of this corner should consider the fact that there's a guard rail on the opposite corner where Milford Ave becomes Ciccone that's been repaired at least three times that I'm aware. Additionally, there's been at least three major car accidents on this corner alone over the past few years. These measures are proactive, preventative, and the least the town should do to remedy the situation. Frankly, they shouldn't even have to be made aware in this manner. Not a two day span goes by that I don't see additional litter on this corner. It's a disgrace. Why is it that accidents occur on this corner and there's no cleanup for the glass, broken car parts, wooden shards from the telephone poles, not to mention the bent/damaged signposts. These remains of the accident scene are HAZARDS not just to high school kids, but the young children that live in that immediate area. Does the town really mean to put the onus on the homeowners to clean up the remains of these accident scenes? Sadly, yet another accident occurred sometime in July. The driver - probably texting - smashed into a telephone pole contributing even more debris to the steady stream of rubbish that's littered and left on the corner regularly. Don't get me wrong, the main concern is the injured or worse in accidents occurring anywhere. However, what is with New Milford's piggish policies regarding what should be considered basic cleanup and maintenance? I mean directly littering and garbage on this corner - aside from the fact that there's a memorial on the corner - is horrible. But why is debris left after an accident? Isn't that considered something the town should clean up? I've personally cleaned up broken glass and car parts remaining from accidents along with my janitorial duties for all the litter and rubbish to such a time consuming degree that I'm considering sending the town an invoice for my time and effort spent doing it. Is it really too much to expect that this debris be cleaned up? I personally think not. This speaks nothing of the structural integrity of the telephone pole! Now, with hurricane Irene pending, we're left wondering if the telephone pole that's been blatantly ignored by any New Milford Borough service is now weakened to a point where it easily could come down from hurricane force winds. Ah, an update. This is laughable if it wasn't so sad. My wife and I finally got around to calling PSE&G (something we shouldn't have to do) regarding the remains left from the accident smashing a large portion of the telephone pole at the intersection on our property. PSE&G sent some one out to look at the situation and they actually came. This, with hurricane Irene pending. We were amazed to see that all they did was tie a small rope around the telephone pole and pseudo-tether it to a nearby signpost. This amazes me because I don't think you need an engineering degree to realize this will do virtually nothing to help the situation. As far as my wife and I are concerned, we plan on holding both New Milford and PSE&G accountable in the event this telephone pole ends up causing any structural damage to our home. 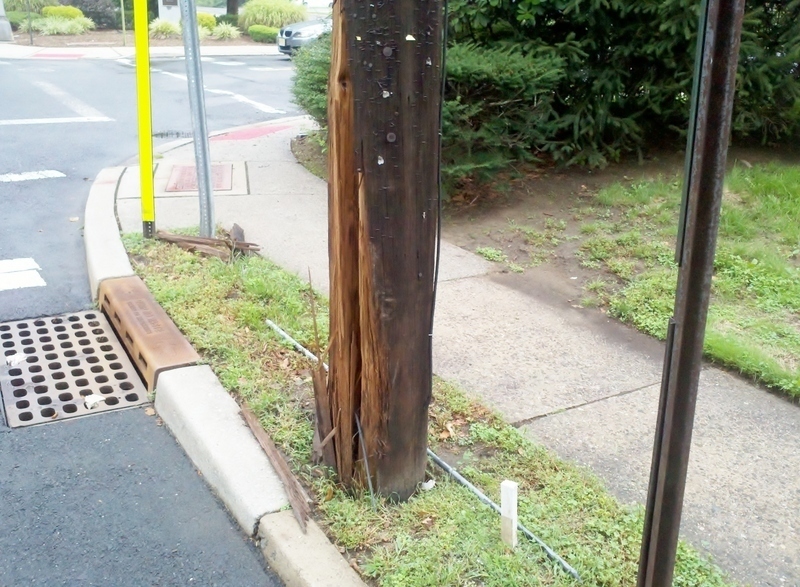 These posts prove a long time lack of basic maintenance resulting form yet another accident at this corner. west end of what is Main Street) is in deplorable condition with huge potholes and a washboard road surface that will jar your teeth out of your mouth. Mayor DeBari you should be ashamed of yourself for allowing this to continue. Readers - write a registered letter to the Boro Clerk in New Milford putting them "on notice" as to this condition as it's the only way you will collect money if you damage your vehicle on this road. Come on Mayor DiBari spend some of our tax dollars in a meaningfull way. Fix this road ! The pavement in front of the parochial school has been torn up for five years. Come on Mayor DiBari and you other slugs on the council. Lets fix this dangerous problem NOW.